Named after its contrasting yokes, it was born out of Pied de Biche creativity. This model quickly became our iconic flat boot. Thanks to its elegant and discrete zip, it is about to be an essential of your wardrobe. Triangle are Pied de Biche favorite flat ankle boots! Named after their contrasting yokes, they were born out of Pied de Biche creativity. Like our whole collection, those women’s low boots were thought as high-end products, simple, elegant, yet fashion. 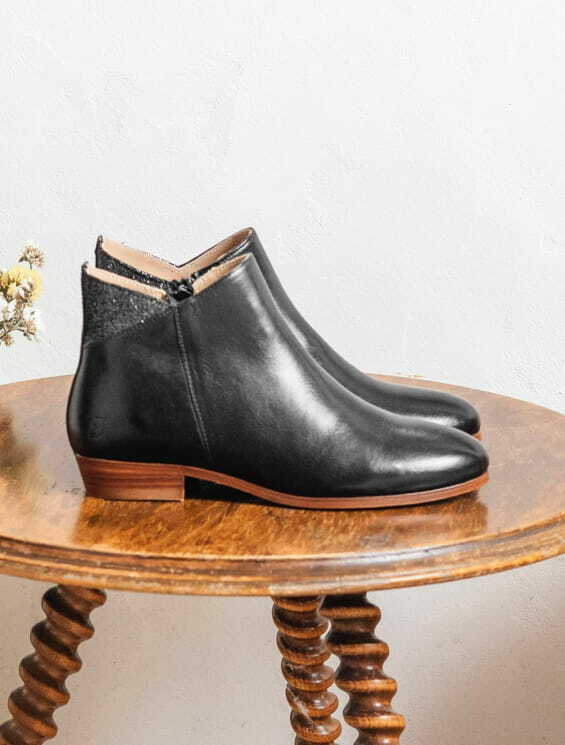 Designed in Paris and hand-made in Porto, Portugal, our Triangle ankle boots are produced by craftsmen with precious know-how of leather work. Carefully selected in Northern Italy, the leathers we use are full calf hides. It is the skillful combination of different materials and colours that define Pied de Biche’s DNA. A subtle contrasting suede Triangle adorns black or brown smooth leather, giving a rock touch to your outfits! Their leather sole, flat heel and calf leather lining make them a staple piece to have in your wardrobe. Easy to pull on with their discrete zip, they are incredibly comfortable shoes and can be dressed up, worn during the day or in the evening. Our Triangle ankle boots are also available in a heeled version, just as comfortable and elegant!